I overheard a conversation a few years back in which employees at a major gun maker spoke about sorting guns during test firing. The more accurate were set aside for extra polishing and sold as a higher grade. That’s fine, I guess, except that it lessened the chance that anyone might ever get a highly accurate gun in their standard grade. There’s good reason brand loyalty runs deep with hunters who have owned dependable bolt rifles made by established companies like Remington, Ruger, Savage, and, of course, the rifleman’s rifle, the Winchester Model 70. Browning might even be considered a step above in quality. Sako also enjoys a reputation for making better if somewhat pricey bolt rifles. I shot a tack-driving Sako .222 for several years, without complaint. Sako is under the wing of Beretta these days. Kimber professes to make America’s finest production rifle, and they may be considered a cut above Browning and Sako. The fit and finish of the wood is superb, and one may assume the internal quality is on a par. Kimber’s Model 84 is a very fine rifle. If you prefer light weight, as I do, look at their Montana, which weighs just over 5 pounds in a short-action or just over 6 pounds in a short-action magnum. Weatherby also enjoys a reputation for making fine rifles in their potent, proprietary cartridges. They also make a really lightweight model, which I ordered a while back in .240 for a test shoot and liked so much I returned a check instead of the rifle. But, if you really want something special, take a look at a custom or semi-custom rifle. Custom shops with names most hunters don’t even know are prospering even in these tough times, and that tells me there are plenty of hunters out there willing to pay more for a better rifle, even if it means a season or two squirreling away nickels and dimes to afford it. Ed Brown, Cooper, Christensen, E.R. Shaw and Magnum Research all make rifles that you may never see in a gun store. Most offer something special. Christensen uses graphite-wrapped barrels. New Ultra Light Arms rifles are pricey not just because they are lightweight but because they are built to benchrest tolerances. Mel Forbes could make his rifles considerably cheaper by simply building to “industry standards,” but he instead pursues perfection, and his business flourishes because of it. Ultra Light’s short-action rifle weighs just 4-3/4 pounds even though it carries a 22-inch standard weight barrel. Mine is a real tack driver. Some assume a custom rifle should have beautifully figured and elaborately checkered walnut. That was once true. Yet most custom gun makers today instead focus on design and precise machining. Most such rifles come with a synthetic stock, and while a tougher finish may be applied to the metal, nothing is added in the way of window dressing there, either. Yes, most hunters still prefer the look and feel of wood. But no matter how well wood is sealed, it remains susceptible to warping during drastic weather changes. And that can hurt accuracy. Inexpensive synthetic stocks are made by simply pouring plastic into a mold and then popping out a finished stock. Stronger and considerably lighter stocks may be built up layer by layer with fiberglass, Kevlar, or some other combination of ideal materials. Thick-walled aluminum pillars may be incorporated to provide screw holes, such that the stock screws tighten against this metal rather than compress the synthetic material. Savage makes a new stock wherein the entire area around the action is metal. Accuracy should not be a big worry when picking a bolt rifle for deer and other big-game. The vitals of these animals present big targets, and any reasonably well-made bolt rifle today should hold shots within 1-1/2 inches at 100 yards. Yet, just this year, a friend brought me a new .300 WSM that he said couldn’t hold a 3-inch group at 100 yards, a complaint quickly confirmed at the range. A look down the bore with a scope revealed that a production tool had chattered the length of the bore; it looked like a raggedy fish fillet. He returned the rifle asking for a new barrel. Instead, the rifle was returned with the paperwork marked “repaired.” The bore, apparently, had been stroked with a fine grinding compound, and the return letter said it now shot 1-1/2-inch groups, which it did. He replied that the still-visible chatter marks would quickly build up fouling, and the matter is not yet resolved. While 1-1/2 MOA is fine for deer, varmint rifles need to do better. A few years back, a company sent me a varmint-weight .22-250 to test shoot and perhaps feature in a magazine article. However, my careful handloading couldn’t tighten groups any below 7/8-inch at 100 yards, and I returned the rifle. The company recrowned the muzzle and sent it back. It still shot 7/8 MOA, and when I called for an explanation, the service rep told me that was within acceptable limits. Needless to say, I didn’t keep that rifle. There are two basic bolt-action designs, control feed and push feed, and control feed is touted as a feature in some of the better rifles, including Mausers, Rugers, and the Winchester 70 (pre-64 and most recent). If you hold a push-feed rifle upside down and very slowly work the bolt to push a cartridge forward and out of the magazine, the cartridge could possibly drop to the ground. Preventing this is the selling point of controlled-round action. As the cartridge pops from the magazine, its rim slips behind the bolt’s extractor and cannot fall away. This is especially touted for hunting dangerous game, and with some legitimacy. That said, all fine bolt rifles do not use a claw extractor, and we don’t hear of cartridges regularly falling out of these guns. Note, also, that when loading the chamber of a control-round-feed rifle, merely dropping a cartridge into the chamber requires the extractor to snap over the cartridge rim upon closing the bolt, sometimes needing an extra bit of push. Better to snap the cartridge down into the magazine and then close the bolt, so the cartridge rim pops up behind the extractor claw. A floor plate may be handy to open and drop rounds in the magazine by hand. But not having an opening at the bottom allows for a considerably stiffer and stronger stock, and potentially more accuracy. Yes, you must unload one at a time from the top. Push the bolt forward only enough to pop a cartridge up from the magazine with the rifle tipped, and there’s no need to fully close the bolt. I also care little how smoothly a bolt glides back and forth. A bit of grease makes virtually any bolt glass-smooth in this regard. If the bolt doesn’t wobble excessively, it suits me. The bolt smoothness I do care about is the unseen and barely felt uniformness of snug contact with the bolt lugs, how squarely they match the recesses in the action, and how little they move out-of-true at the shot. More expensive rifles are hand-fitted in this area. The chambers in factory rifles are typically loose to guarantee ease of chambering and closing the bolt. But this looseness puts the cartridge at the bottom of a trough, just a bit below center, and that means the bullet can start its journey slightly askew. Tighter chambers center cartridges better, as do neck-sized reloads in any rifle. Custom rifle makers use barrels by the best makers, barrels that deliver exceptional, consistent accuracy. They live by their reputations, and most make a good living. Barrels by makers like Douglas, E.R. Shaw, Shilen and the like are not only more accurate but also foul less quickly because they are so smooth. I don’t believe it much matters if the bore is button rifled or hammer forged, nor whether it is chrome-moly or stainless steel. And, finally, buying a custom rifle allows you to select a custom cartridge, one no longer (if ever) in factory production. The .284 Winchester is still a great cartridge, and is, or at least was, New Ultra Light Arms’ most popular chambering. 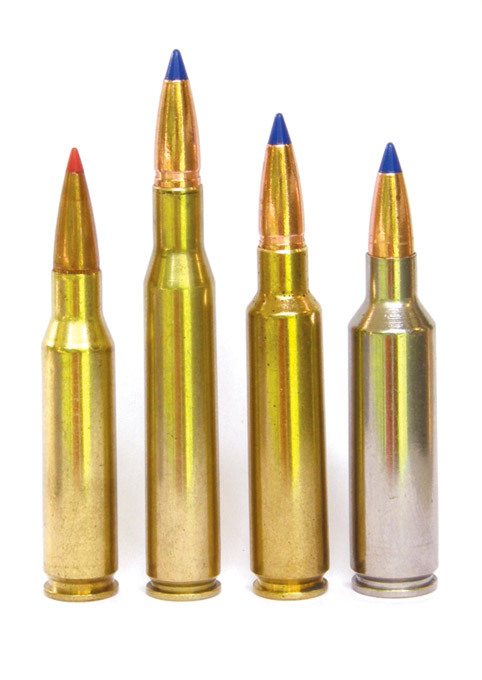 Another cartridge growing in popularity is the .280 Ackley Improved, right on the heels of the 7mm Remington Magnum, though it uses a smaller case burning considerably less powder. Shop around before buying your next rifle. Visit the custom makers’ websites or phone the companies and ask for print catalogs. Handle or better yet shoot a custom rifle whenever you get the chance, and you may find yourself squirreling away those nickels and dimes.